Fear of pain demonstrates significant prognostic value regarding the development of persistent musculoskeletal pain and disability. Its assessment often relies on self-report measures of pain-related fear by a variety of questionnaires. However, based either on “fear of movement/(re)injury/kinesiophobia,” “fear avoidance beliefs,” or “pain anxiety,” pain-related fear constructs plausibly differ while it is unclear how specific the questionnaires are in assessing these different constructs. Furthermore, the relationship of pain-related fear to other anxiety measures such as state or trait anxiety remains ambiguous. Advances in neuroimaging such as machine learning on brain activity patterns recorded by functional magnetic resonance imaging might help to dissect commonalities or differences across pain-related fear constructs. We applied a pattern regression approach in 20 human patients with nonspecific chronic low back pain to reveal predictive relationships between fear-related neural pattern information and different pain-related fear questionnaires. More specifically, the applied multiple kernel learning approach allowed the generation of models to predict the questionnaire scores based on a hierarchical ranking of fear-related neural patterns induced by viewing videos of activities potentially harmful for the back. We sought to find evidence for or against overlapping pain-related fear constructs by comparing the questionnaire prediction models according to their predictive abilities and associated neural contributors. By demonstrating evidence of nonoverlapping neural predictors within fear-processing regions, the results underpin the diversity of pain-related fear constructs. This neuroscientific approach might ultimately help to further understand and dissect psychological pain-related fear constructs. Pain-related fear, often assessed through self-reports such as questionnaires, has shown prognostic value and clinical utility for a variety of musculoskeletal pain disorders. However, it remains difficult to determine a common underlying construct of pain-related fear due to several proposed constructs among questionnaires. The current study describes a novel neuroscientific approach using machine learning of neural patterns within the fear circuit of chronic low back pain patients that has the potential to identify neural commonalities or differences among the various constructs. Ultimately, this approach might afford a deeper understanding of the suggested constructs and might be also applied to other domains where ambiguity exists between different psychological constructs. Self-report measures of emotional states are paramount for behavioral neuroscience by enabling the understanding of brain response patterns (Shrout et al., 2018). However, the validity of self-reports is limited (Choi and Pak, 2005), probably also because often overlapping psychological constructs are assessed, illustrated by the fact that various questionnaires attempt to assess related constructs. 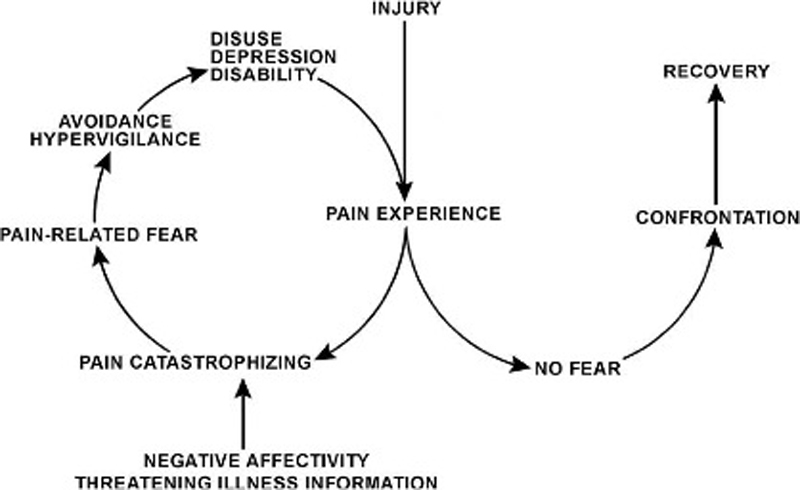 One example is pain-related fear (PRF), which is a major explanatory variable of disability in patients with persistent musculoskeletal pain (Crombez et al., 1999; Vlaeyen and Linton, 2000; Vlaeyen et al., 2016). For the assessment of PRF, various questionnaires exist based on potentially different constructs such as fear of movement/injury and reinjury/kinesiophobia, fear avoidance beliefs, or pain anxiety. There is an open debate on what their scores reflect on the fear–anxiety spectrum (Lundberg et al., 2011; Caneiro et al., 2017). Fear represents a reaction to an imminent threat, preparing the individual for “fight-flight-freeze,” whereas anxiety is described as being more diffuse (e.g., cognitions about a future threat; LeDoux and Pine, 2016; Kreddig and Hasenbring, 2017). While PRF questionnaires do not clearly distinguish between these emotions (Lundberg et al., 2011; Kreddig and Hasenbring, 2017), brain research provides evidence for a functional differentiation of fear and anxiety. Both emotions are controlled by the fear circuit (Tovote et al., 2015); however, subcortical regions (e.g., the amygdala) seem to be more involved in fast and defensive fear reactions (short defensive distance to threat) while cortical regions (e.g., the prefrontal cortex) are more likely to be responsible for complex cognitions of anxiety (large defensive distance to threat; McNaughton and Corr, 2004; Qi et al., 2018). Therefore, advances in neuroimaging enable exploring the subcortical/cortical contributions to PRF constructs by examining interrelations between self-reported emotional states and brain response patterns. Specifically, machine learning techniques such as multivariate pattern analysis (MVPA) applied to functional magnetic resonance imaging (fMRI) data make it possible to directly study the predictive relationship between a content-selective cognitive or emotional state (expressed as a label) and corresponding multivoxel fMRI activity patterns (Haynes, 2015; Hebart and Baker, 2017). The label may have discrete (classification) or continuous (regression) values such as questionnaire scores (Formisano et al., 2008). Back-straining activities (i.e., bending and lifting) are the most feared and pain-provoking movements among people with low back pain (LBP), based on ratings of perceived harmfulness or physiologic responses (Leeuw et al., 2007a; Glombiewski et al., 2015; Stevens et al., 2016; Caneiro et al., 2017). As such, bending and lifting, either active or passive (e.g., through pictures) have been frequently used to provoke PRF (Leeuw et al., 2007c; Trost et al., 2009; Barke et al., 2016; Caneiro et al., 2017). Therefore, we provoked PRF by presenting video clips of daily activities including bending and lifting (harmful condition) and harmless activities such as walking (harmless condition) in a sample of 20 patients with nonspecific chronic LBP.